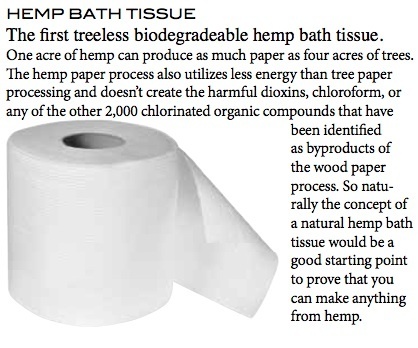 Using hemp as paper is not revolutionary. The use of hemp to make paper dates back well over 2,000 years, and was used by many ancient civilizations. It is considered by some to be the world’s oldest agricultural plant and was used to produce paper, among many other things, worldwide until fairly recently. The Declaration of Independence and the Gutenberg Bible were both written on paper produced from hemp, as were almost all works written up until around the mid-1800s and the importance of hemp in rope manufacture – essential for any navy – gave the plant a similar status to that which oil currently has today. George Washington was a famous exponent of the plant and grew it himself. However, today hemp production is a fraction of what it once was. Many countries, like the United States and United Kingdom, regulate hemp growth or have banned it altogether because the plant is the same species as cannabis. Perhaps pushed by the emerging products and processes that could replace hemp and many of its uses. Paper manufacturing is one of the largest energy consumers around the globe, and although switching to hemp-based paper will not necessarily change the amount of energy needed to produce paper it will help alleviate the demand on the world’s trees and requires less chemicals. Deforestation releases large amounts of carbon dioxide into the atmosphere, and, whilst paper manufacturers do use tree farms and second-growth forests these sources can not supply nearly enough timber. Neither is wood-based paper making a clean process. According to http://www.ecology.com: “the U.S. Toxic Release Inventory report published by the U.S. Environmental Protection Agency (EPA), pulp and paper mills are among the worst polluters to air, water, and land of any industry in the country. There is clear evidence that wood-based paper manufacturing not only damages the environment sourcing its raw materials, but the by-product of the production process is highly toxic. Wood is also not necessarily the best resource for paper because it does not have a very high cellulose content. Paper manufacture relies on breaking down the raw materials to cellulose. Wood has a cellulose content of around 40%, although this does differ between tree species, whereas hemp has a cellulose content nearer to 80%. A lot of the paper manufacturing process involves removing the useless – from the paper manufacturers point of view – 60% of the tree to leave the pulp. So when it comes to hemp pulp vs. wood pulp the hemp pulp is much more efficient because of the higher cellulose content. Not only this, but a hemp crop can mature in four to six months meaning that each acre can be much more productive than an acre, or even a few acres, of woodland. Trees need around 20 years and upward to mature enough to be pulped. Alongside the economic and product quality benefits to be had there is serious economic benefits if hemp paper production was taken up in a big way: through job creation and increased farm revenues for hemp farmers. So, why are we still using wood to produce paper? There are various theories and reasons why hemp became vilified, going from one of the world’s main agricultural crops to only being produced in a handful of countries; from the Marihuana Tax Act of 1937 in the US to chemical producers hoping to increase revenues. Regardless of how we got into this situation hemp paper production has some obstacles preventing its mass production: hemp paper requires paper mills to spend fortunes changing their machines so that they can deal with the more fibrous hemp pulp, the continuing confusion between hemp and cannabis plants, and perhaps the lingering influence of chemical companies such as DuPont. Of all the confusion appears to be the biggest obstacle, especially in the US where it is still against the law to own hemp seeds thus making it impossible to grow the plants commercially. Until these obstacles are tackled worldwide hemp paper production will be hamstrung despite its benefits.